It really is time for a BearBear hair cut. We’ve been told. By friends and family. By you guys. By neighbours. By strangers who’ve made it apparent by asking how old my little girl is. I think this finally might’ve done me in — the Bear is going to get a REAL hair cut. Here’s the slice of backstory you need:Â The new iPhoto, this awesome software that comes standard on a Mac has this really cool Face Recognition feature. After you tell it who a person is by tagging their face, it begins to scan your other photos to look for more pictures that might be the person you just tagged. After a while it seems to get pretty accurate. I have been really impressed when I look at a picture of myself that looks a lot like my Mom and it asks if it’s a picture of my Mom. It’s also looked at pictures of me where I look more like my Dad and asked if I’m him. I know that probably makes it sound less accurate, but trust me, you need to see what I’m talking about. It’s pretty impressive. Since we’ve taken a gabillion pictures of the Bear since he was born, iPhoto has gotten pretty good at recognising pictures of him. 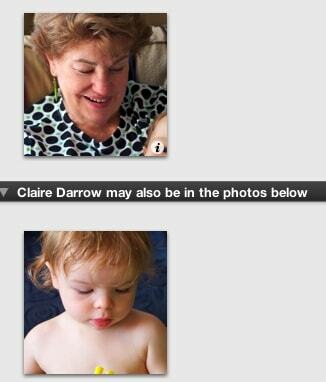 Occasionally if we take a picture of another baby, iPhoto might think that baby is the Bear, until we tag the other baby to tell iPhoto it’s someone different. Yup. iPhoto thinks the Bear is his G.C. (Short for “Grandma Claire”). They really look a lot alike in that photo! Which means, if I’m honest, the Bear’s really starting to look like a girl. I’m hoping to muster up the strength to give those goldilocks that are getting blonder by the day a wee trim…tomorrow. Feel free to pray for me. (And HH! He doesn’t want to let those curls go — I think even more than me!) I’ll let you know how it goes. Good Luck !! It’s a big step for Mom & bear…..
You can do it! It has to happen at some stage, ready or not, and I’m willing to bet he’ll thank you in 15 years for not letting it continue to get longer and longer! Sorry to disagree, but I say the curls should stay! Don’t let yourself be done in by the community – let the curls live on as long as possible!!! I love it, Amiee! For the sake of the Bear not walking into walls because he has hair in his eyes, I think he’s gonna have to have a trim today. My Mom has warned me that it might be painful for me. But I think it’s time! Thanks, Lisa! I couldn’t not take a picture of those carrots!